Learning to read is a massive adventure in itself, but discovering the library—a magical place where the stories are plentiful and the books are free—is downright mind-blowing. In an effort to match the fun between the pages, the Mexican branding studio Anagrama transformed the interior of a local heritage site into Niños Conarte, a geometric mountain range of literature. The structure of the former steel foundry couldn't be altered, so the firm focused instead on creating an angular topography for the flooring—meant to mimic the terrain surrounding the library, in Monterrey. 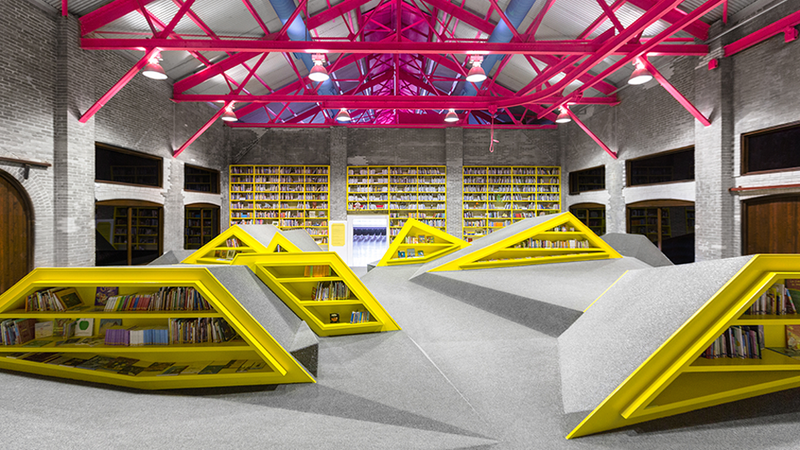 The carpet-covered installation is part playground, part storage space, with enough nooks and crannies to make find a new read a unique kind of hide-and-seek. Toss in some bean bags and big comfy pillows, and hot damn—it looks like a nice place to spend an afternoon.